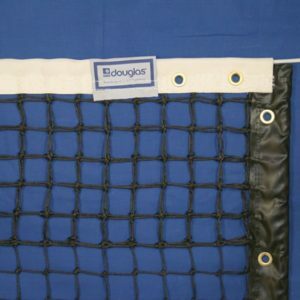 A DIVISION OF DOUGLAS INDUSTRIES, INC.
All NSP Tennis Nets meet USTA requirements for official size. Netting is 1-3/4” square mesh braided polyethylene, unsurpassed for durability and weather resistance. 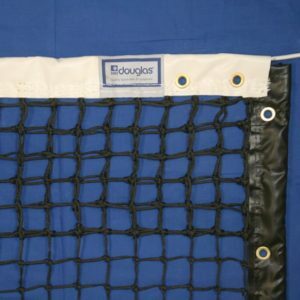 Vinyl bottom tape and side pockets of headbands are polyester based and won’t shrink, mildew or rot when exposed to the elements. All headbands have been lock-sewn with four rows of 32# white polyester thread. 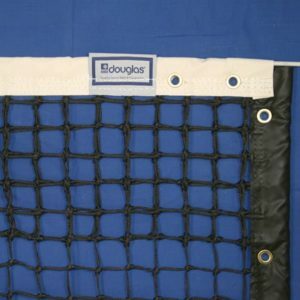 The side and bottom tapes are double lock-stitched with black polyester thread. Nets include fiberglass side dowels, lacing cord, heavy-duty vinyl coated cable and an adjustable center strap.